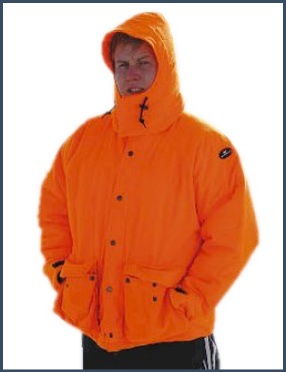 Our high visibility blaze orange jackets have superior weight micro denier fabric in a 280 gram Tricot outer shell and a quilted brushed polyester inner shell. The inner lining contains patented RE-tain technology for maximum body heat retention. Features include 2 deep bellows pockets with 2 snaps and fleece lined side entry plus an inner pocket for a cell phone or radio. A 2 way high performance front zipper for comfort and convenience with a storm flap for added protection. A 3 panel hood, zipper detachable with hook and loop and 2 snap closures plus a drawstring. Cuffs have adjustable hook and loop closures. Our high visibility safety jackets are waterproof, windproof and breathable. Blaze Orange as shown. To see this jacket in camoflauge fabrics go to hunting gear.